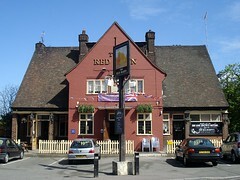 Pub near Barnehurst Station. Previously under the Mitchells & Butlers "Community Pubs" brand, it was transferred to the Stonegate Pub Company in October 2010 and is now part of their "Local Pubs" sub-brand. Entry is to the side of the bar, where there are a few padded half-round armchairs. Further in, the space opens up into a larger area with normal chairs and tables. Directly next to the entrance is a side room with a pool table. The decor is fairly standard chain-pub. There are at least two flatscreens. As well as a few picnic benches out the front, there's a decked patio/smoking area to the side. Kake visited on a Wednesday afternoon in April 2011. Three real ales were available: Bombardier, Harvey's Sussex Best (£1.28/half), and London Pride. There were about half a dozen people in when I arrived around 2pm, and a few more turned up while I was there. Music was playing, ranging from laid-back to bland, though not loud enough to be annoying. There was also something — a clock? — which played the Westminster quarters on the hour and half-hour. One of the flatscreens was showing sports results with the sound off. As of April 2011, food is served until 9pm every day. It's standard pub food, fairly cheaply priced, from a laminated menu that is clearly offered chain-wide and almost certainly all bought in frozen. An offer of two meals for £6 runs noon-5pm Monday-Saturday, and there are daily deals after 5pm. Accessibility: A large step up to get in. Once you're in, there's level access to the bar, all the interior seating, the pool room, the ladies', and the accessible toilet. Not sure about the gents' and can't remember about the beer garden/patio. There are a few parking spaces out the front. Last visited by Kake, April 2011. Food times taken from menu in pub, April 2011. Opening hours taken from the Red Barn website, April 2011. Last edited 2013-05-10 07:54:14 (version 4; diff). List all versions. Page last edited 2013-05-10 07:54:14 (version 4).